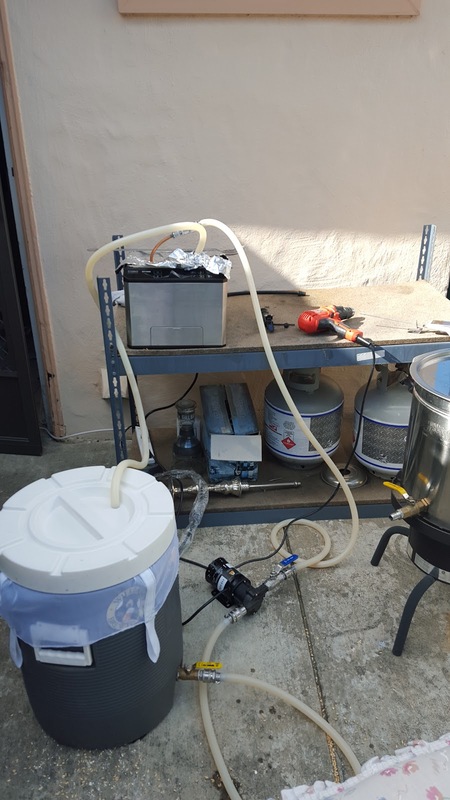 About a month ago or so this thread popped up over on /r/homebrewing. That got me thinkin. Why not? Initially I was going to drill holes in the lid, but I opted to skip that step and use foil to cover it up. Much less of an expensive modification this way. I've used it twice now. Run #1: Pump controlled by temp with sous vide circulating at 170F. So if the temperature drops below the set point (~152F was the set point here) it would start circulating until it got back up to temp. This was fine, but I lost out on a lot of the efficiency I gained by constantly recirculating. Not a huge problem, but also not ideal. Worked great, but I wasn't satisfied. Run #2: Constant pumping, sous vide set 2F above set point (same 152F set point). It wasn't particularly cold on attempt one or two, so heat loss in the tubing was minimal and the runs aren't particularly long anyway. Run #2 was far more successful, though I did eventually bump the sous vide to 5F above set point which resulted in a fairly consistent 152-153F reading. I imagine I'll have to work on it over a few more batches to get it exactly the way I want it, and that's fine. But it's way more consistent this way. I also got back to my normal efficiency numbers, which was really nice. Makes life easier when you know what to expect, and though the first test worked fine, it added another variable in pump run time that just... wasn't what I wanted. Citra, Galaxy, Mosaic @ 9, 7, 5, 2oz each addition for about 65IBU. 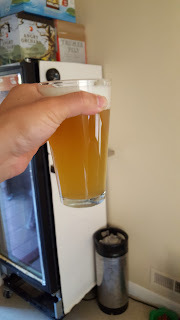 GY054 (Vermont IPA Gigayeast) fermented for 10 days @ 66F ramped to 72F for 4 days. Cold crashed and kegged. No fining. Gloriously hazy, hop juicy as hell and I love it. Simple is better. Back on 2/16 /u/KidMoxie over on the homebrewing subreddit posted his Geburtstagsparty – “Traditional” Vienna. So I did it. I followed his outline more or less. The ingredients I followed exactly, because why bother making it if I can't at least do that much. Used a healthy starter of WLP830. Simple, straight forward. 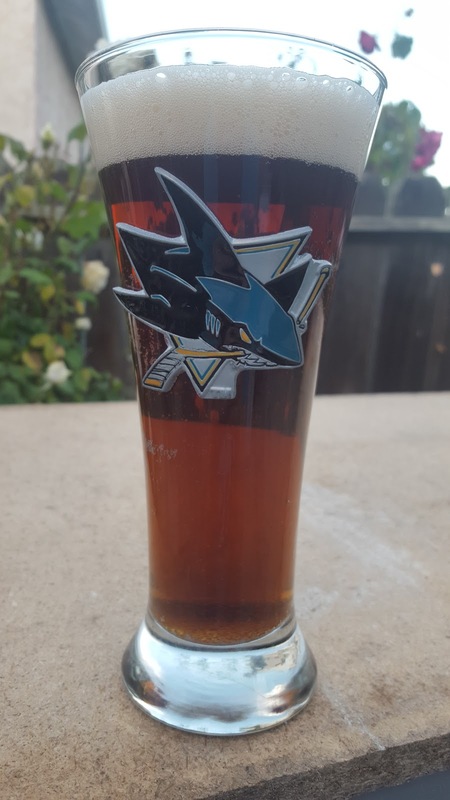 Exactly the kind of beer I like to brew lately. Mashed @152F for 60. Skipped the mash out step because lazy/time constraints, and I really just don't normally mash out. OG: 1.047 FG: 1.012, ABV comes in a little over 4.5% which for me is perfect. I fermented 7 days at 52F followed by a gradual rise (~4F per 24hrs) to 68F where it sat for 5 days for a diacetyl rest and to finish up completely. At that point I cold crashed it for 3 weeks in primary and then racked it into the keg & added gelatin to fine it. The color isn't quite the same as what KidMoxie got. I attribute that partially to the glassware, and partially to just brewing it on a different system. Either way, I love the color and the clarity is great. Moderate/high toasty malt. I think I get a tiny bit of noble hop, but my nose for hops isn't particularly good and I could be wrong. I mostly get malt, malt, and more malt. Very clean aroma, no detectable baddies far as I can tell. Crystal clear, leaning more towards copper than reddish for me but I'll take it. Fluffy white head that sticks around forever, laces the glass all the way to the last gulp. Toasty, malty, awesomeness. Low floral hop notes and just enough bitterness to balance out the malt. Not overly sweet at all, just pleasantly malty. Finishes dry, clean, and leaving me wanting another. Or three. Medium/light body, I carbonated it to around 2.6vols because that's where I like most of my beers anyway. I am a huge fan of this style and certainly this recipe. I have had people tell me now that I need to make sure this is always on tap at my house.